A few weeks back, I spent the day at Cyndali’s house, melting things with my local arty friends. With the few brain cells that survived the fumes, I’ve been thinking of all the things I see in a different way. Now, it’s not just “I wonder if I can glue this”, but “I wonder if I can melt this”. 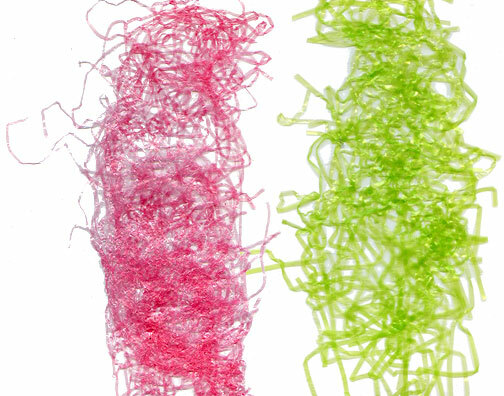 This week, my eye fell upon Easter grass, which I turned into flat, cutable webbing. Be afraid. 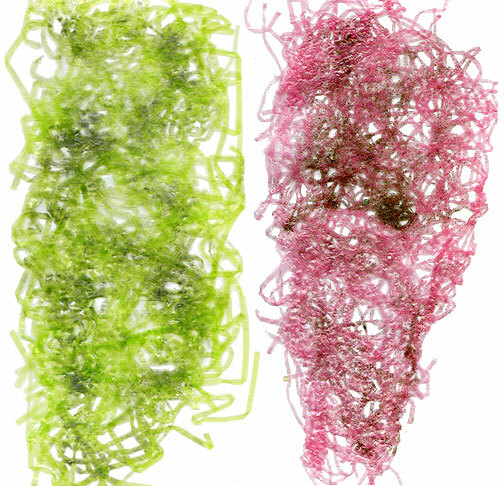 To do this, you’ll need clear, shiny Easter grass, and parchment paper, which is available at most grocery stores in the wrap and foil section. 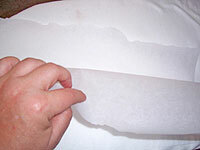 Tear off a sheet of parchment paper, and fold it in half. 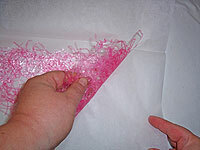 Open the fold, and cover one half of the paper with Easter grass. 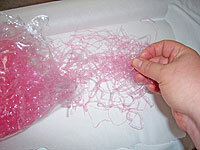 To make loose webbing, pull a few strands at a time from the bag of grass. 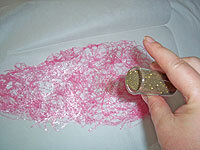 For something denser, pull it out in small clumps. Spread the grass out somewhat evenly on half the paper. 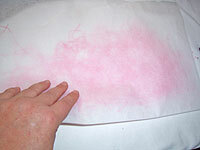 Cover the grass with the other side of the folded parchment paper, and tuck any stray pieces of grass between the sheets. 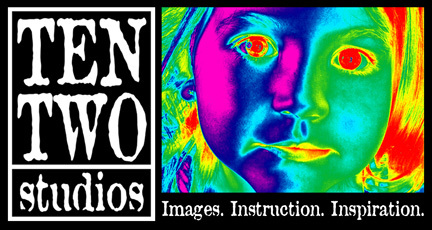 Now, the scary part. 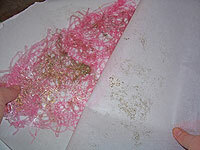 Press the parchment covered grass with a hot iron. I had mine set on cotton, which is pretty hot. 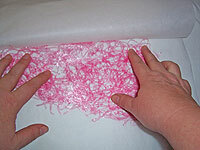 At first, I pressed down on each section of the paper, rather than sliding it, to flatten and melt the grass. 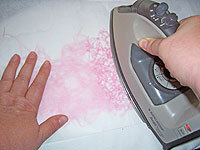 Then, I slid the iron from one end to the other. After peeking at the progress, I decided I needed to flip the parchment over, and press the grass from the other side. 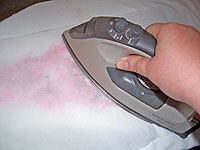 This time, I just slid the iron slowly from one end to the other. Wait a minute for the melted grass to set, then peel back the parchment. 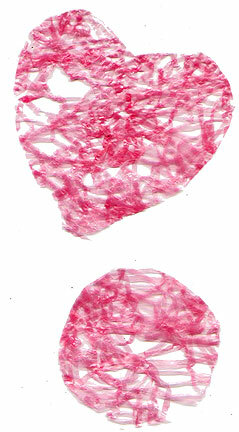 If the webbing is holding together well, peel it off the other side of the parchment. If not, hit it with the iron again. 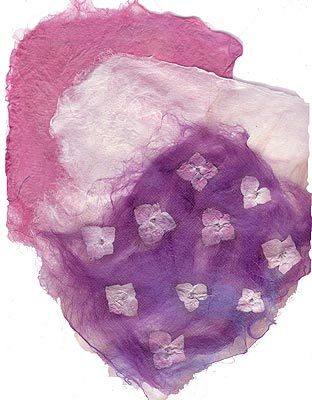 I found that I could sort of square off the fuzzy edges by pushing the webbing against the fold of the parchment, and giving it another press with the hot iron. This is good for catching all those wayward strands of grass. 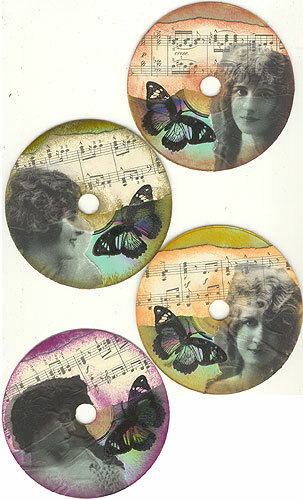 For fun, I decided to see if I could change the color a bit with some embossing powders. I’m not sure how effective this was—it looks great from an angle, in the light, but otherwise just looks a little blotchy. Perhaps I just need to work on a more even coat of powders. 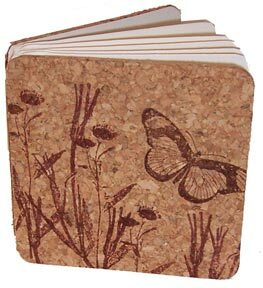 I sprinkled the embossing powder over the webbing while it was sitting on folded parchment. 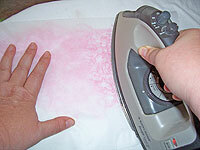 It’s best of you do this right on the ironing surface, rather than trying to move it with loose powder. Cover with parchment and press. 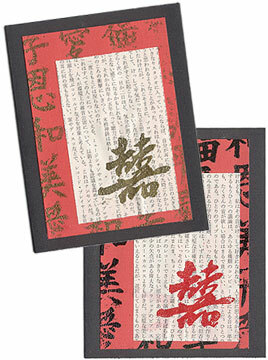 You’ll be able to see the embossing powder melting against the parchment. 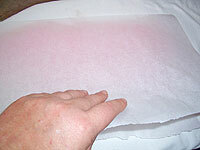 When the sheet has cooled for a moment, peel back the parchment. While it’s possible to reuse parchment over and over again, I suggest throwing it away once embossing powder has been used on it. What can you do with it? Well, so far, the only thing I’ve done is cut it into shapes and glue it to cardstock with a glue stick. 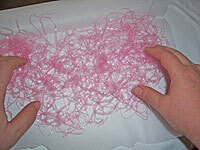 For those of you who are into fabric things, this stuff can be sewn like lace trim. Anybody want to whip up some sample projects using this technique and show them off? Go ahead. I dare you.